Finding a suitable parking spot for your car can be quite a troubling task. If you live in populous city, this task is even harder. Studies have shown that nearly half of all the traffic we see on the roads involves someone looking for parking. Since most of us don’t have prior notice on the available parking spots, it requires a lot of patience to find one in a densely populated city. Thankfully, technology today can help us find parking spots well in advance in most major cities. Today we’re reviewing a very useful app that will help you find parking spots in your area. It’s called SpotZ, currently available for both Android and iOS devices. Now you can finally say goodbye to all the troubles and difficulties you’ve ever had while finding a parking spot. SpotZ is user-friendly, offering various features and a great design. SpotZ is created with all the features you need for finding and reserving a parking spot in your area. 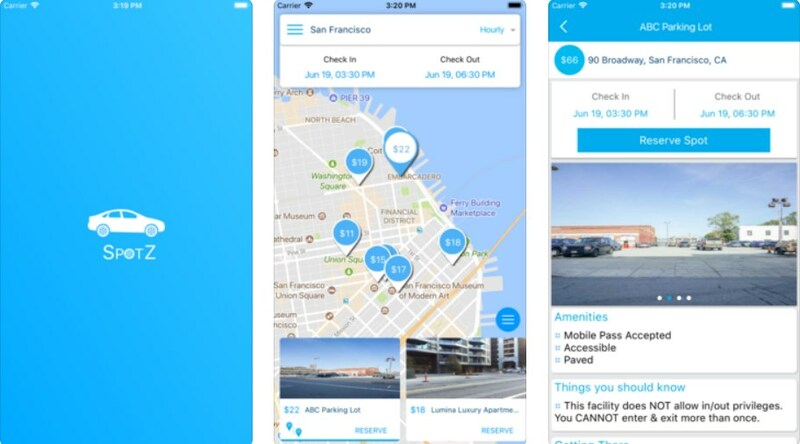 While there are so many other solutions and services, the SpotZ app offers a huge database of different garages, parking lots, and parking valets in many states and cities. In addition, it provides with detailed information about those facilities. All you have to do is open the app’s live map and add the location as well as check-in and check-out date and time. Then, pick the option that suits you, reserve it and pay for it via the app. This payment method is more secure, quicker and more time-saving. Also, review the information about the parking lot, garage or parking valet that you chose and mark various spots as your favorites for later. Designed with clean and elegant user interface and supporting thousands of parking lots, parking valets, and garages nationwide, SpotZ is free for download on both Google Play and the App Store. Get it right away by clicking one of the direct links below.